It is with great sadness that I am writing to let you know that our Beloved Chica passed away on January 20, 2017. She was granted passing in her sleep. The reason I am contacting you is because she came to us April 6, 2006 from your facility. We adopted her through a fundraiser for your organization that was held on Dyess Air Force Base around the end of March/beginning of April '06. It was a bowling tournament put on by "Frego" Wheeler, our Chief Master Sgt's dog. We kind of fell in love with her and made arrangements to adopt her as soon as she was spayed a few days later. She came to us somewhat broken. It appeared she had been abused, as she cowered when we reached to pet her, she did not like men (which made it hard for my husband) and she most certainly did not like men in uniform (which compounded her distrust of my husband, as he was active duty at the time). But after a little while, she came to realize that we were not going to hurt her and she found a spot on our bed at night to sleep and learned that she loved to place fetch with toys and to our surprise loved to speed through the house in a game of keep away (which was highly entertaining, LOL). She also discovered that she LOVED treats. My husband began giving her treats initially as a way to win her over and over the course of the years, the habit became that as soon as he got home from work, all the babies lined up in the kitchen and waited (not so patiently, LOL) for their afternoon treat. She moved from Abilene with us to Lake Charles, Louisiana, where we currently reside in August of 2010. She had a large home she had free reign over and an even larger, fenced yard to run and bark and chase squirrels in. At the time of her passing, she left behind my husband, myself, our 13 yr old daughter and 3 fur siblings (all rescues). 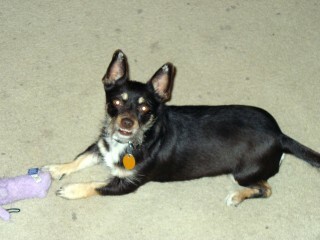 When we adopted her, her name was Chiquita, which we thought sounded like a banana, hahaha, so we shortened it to Chica. We occassionaly used the name Chiquita when speaking to her, but also Chica Baby as well as "old momma" as she was old and she acted as momma to our other fur babies. I have attached a picture of her, taken shortly after her adoption. The one thing we never got and would still love to have was a photo taken at the bowling alley on base the day of the event. Pictures were taken of all the adopting families with their new family member. I don't know if you would even have it in your archives from so long ago, but if you do, it would mean a great deal to have it. We took her to one of our local funeral homes, who does pet cremations, and she is now back home with us, placed prominently on our fireplace mantle so that she can still be in the living room with us as she always was. Please know that Chica, had a long, happy, love filled life with us. We are not sure just how old she was. The guess was that she was 3 or 4 yrs old when she came to us, so that would have made her 13 or 14 years old. I know you sometimes wonder what becomes of them once they leave your care. In this case, she was loved. We miss her terribly and even now in writing this I am teary eyed. Thank you for bringing her into our lives, the photos and memories we have of her will last us a lifetime.